Most readers of the New Testament study the great stories of Jesus through the lens of western culture. But how well can we really understand this Jewish teacher if we don't understand his context? In this series of books, Gary Burge uses his extensive knowledge of the first century world and the Middle East to offer insights not available to the average person. Each book will develop important cultural themes and wrap them around well-known New Testament passages. And the result will be insights rarely gained elsewhere. 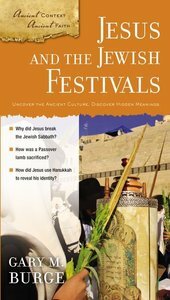 In this fourth volume of the Ancient Context, Ancient Faith series, Dr. Burge explores six different Jewish festivals as they were celebrated in the first century and examines how Jesus used the imagery of the festivals to unveil his own mission. Discover the Jewish Sabbath, Passover, Tabernacles, and Hanukkah as Jesus knew them. About "Jesus and the Jewish Festivals (Ancient Context, Ancient Faith Series)"
This Zondervan ebook sketches out the rise of the great Desert Fathers and Mothers of the 3rd - 6th centuries, and then shares the stories and sayings of five of their greatest leaders. It will instill wisdom in the everyday lives of modern Christians through the storytelling of great monastic biographies taken from Egypt, Palestine and Syria. Volume 5 of the Ancient Context, Ancient Faith Series. See Jesus through the eyes of two men and three women. Each character in the story---a tax collector, a Phoenician woman, a centurion etc.---brings along elements from their own world now hidden from us because we do not share the culture of Jesus' world. Insights from the first century Middle East abound to unlock profound insights about Jesus and his audience. Volume 3 of the Ancient Context, Ancient Faith Series. This new book in the Ancient Context, Ancient Faith series illuminates the images in the Old and New Testaments that communicate profound truths about God and his relationship with his people, by describing the cultural world they were created in and explaining how the ancient context contributes to their meanings. Observe how Jesus celebrated the great festivals of Judaism. In each of the six accounts, you will explore the Jewish festival as it was celebrated in the first century and then examine how Jesus used the imagery of the festival to unveil his own mission. Explore the Jewish Sabbath, Passover, Tabernacles, and Hanukkah as Jesus knew them. Volume 4 of the Ancient Context, Ancient Faith Series.